Follow us on twitter, facebook, and calendar for latest updates and to find out what else we are up to! We are writing a prayer, devotion, and/or creating art for the national Presbyterian Campus ministry Advent devotion book with this!! Each week the PSF reads along with the Ukirk lectionary. September 19 we read the beatitudes in Matthew 5. The are beautiful in their simplicity of what is blessed. We can read these words and agree -- yes, this is what God is about. These are easy to understand. Yet, as we easily skim through or social media feeds #blessed stands in stark contrast to Jesus' words. It's also just that hard. Here is how a brief search of social media sites defined blessed. A quick search of #blessed and this is how its defined. Read again Matthew and contrast where happiness is found. It is no wonder we are more anxious at times. When we are faced with well put together pictures of happiness and #blessed, it is easy to assume that is what blessing looks like. We can feel apart from God and God's promises. The promise and good news of Jesus' words in this passage is that blessedness is not based on exterior traits, stuff we have, being popular, keeping it together, or getting it right. Each week the PSF reads along with the Ukirk lectionary. Last week (Sept. 12) we read the story of Jesus' call of the disciples in Matthew 4:18 - 25. Jesus meets the soon to be called disciples while they are taking part in their everyday work and calls out to them. They immediately drop everything (their work and their family) to follow Jesus. The first disciples were not looking for Jesus. Instead, Jesus found them in the midst of their daily routine. How does God find us in our routines? How is God speaking to us? The daily examen is a practice where one reflects at the end of the day on both the consolation (graces) and desolation (absences) of God throughout the day. It is an intentional way to see where God has been approaching us all day and a space to ask for God's presence where it has felt absent. The first disciples dropped everything to focus on and follow Jesus. What would compel you to more fully focus and follow Jesus? What’s happening at the Presbyterian Campus Ministry! Pancake Breakfast, Sun. Sept. 23: Sign up on ISERVE here. We prepare and serve a hot breakfast to all who need it at First Presbyterian Church, Morgantown, 7 am – 10 am, 456 Spruce St, downtown, come in on Forest Ave, head upstairs to gym. We will serve again Nov. 11! Follow along with us! Weekly Bible reflection. Stay connected even when you can’t be there. Still want to go hiking! Weather is not on our side. Each week the PSF reads along with the Ukirk lectionary. Last week (Sept. 5) we read the story of Jesus' temptation and the whole armor of God from Ephesians (Matthew 4:1–11 Jesus Tempted in the Desert, Ephesians 6:10–20 The Armor of God). In Matthew's telling, Jesus is first tempted to relieve his hunger, then to save himself, then to command all the kingdoms of the world. Read Luke's version and notice an ordering difference and wonder for a bit about each author's choice. Supposedly the third temptation is the greatest. Why would each author choose a different final temptation? What would be the most challenging for you to refuse? Food when you are starving? Healing/life when you are close to death? All the power in the world? Ephesians reminds us that we need to be strengthened with truth, faith, righteousness, and most importantly prayer for ourselves and prayers for others. In the tradition of the PC(USA) Matthew 4 shows up most often around Lent. However, we face temptation to follow other more compelling calls and paths all the time -- especially as we start a new school year or place. Here is a prayer to sustain us inspired by Matthew 4:1-11, Mark 1:9-15, Luke 4:1-13.
you know the tests and trials we face. Walk with us through this wilderness. We are reading through the Ukirk lectionary each Wednesday primarily focusing on Matthew. Last week's reading was Matthew 3:1–17 John the Baptist/Jesus' Baptism. John was clearly not the clean cut, respectable, hip pastor of the day. I don't think camel hair was any more popular then -- nor was eating locusts. John's presence offered a challenge to the faith tradition as it was being organized and lived out. He called for a new way of thinking and living. It was a challenge to the way things were always done. If you read on, you'll see he is not kind to the religious leaders and calls on them specifically to change their lives. How does God put experiences and people in our path that challenge our assumptions? How can challenges to our faith help us see new places God is working? Where is God speaking in unexpected places and people? Last week we talked about that fear in the pit of the stomach and places that are not life-giving but are rather death-dealing. To be challenged in our faith is different. It is not something to be feared but something to explore with trusted mentors and in a community of believers. John's challenge to the way things always have been comes as he is baptizing followers and Jesus. We must remember that our baptism does not mean an easy life, but a life of both great joy and great challenges. The promise in baptism is that Christ has gone before us and God's grace is always with us. In what ways has your faith been challenged? In what ways have you seen God's grace? We are reminded of how challenging and costly this life is by Dietrich Bonhoeffer in the Cost of Discipleship: Costly grace is the gospel which must be sought again and again, the gift which must be asked for, the door at which [one] must knock. Such grace is costly because it calls us to follow, and it is grace because it calls us to follow Jesus Christ. It is costly because it costs a man his life, and it is grace because it gives [us] the only true life. The PSF follows the Ukirk lectionary along with other Presbyterian Church USA campus ministries each year (see our read along with us). We are specifically focusing on the Matthew texts in the lectionary this fall. The second week of PSF we read together Matthew 2:13 - 23 and Galatians 5:16 - 25. I John reminds us that perfect love casts out fear. While we seek and see God in places of deep joy and head down those paths, paths that fill us with fear need to be scrutinized. There is reasonable fear-- of the new, the unknown, the obviously dangerous, etc. But fear that grows in the pit of our stomach, fear that comes when we know the our well-being (peace) or that of others is threatened is a 'do not enter,' or turn around sign. Those might also be times and places where we need the support of the Body of Christ/the Church to fight against whatever is not seeking well being (peace) for all of God's children and creation. So, while we may turn for a bit, we may strengthen ourselves in community to return and witness to God's radical love, grace, and welcome. Galatians 5 again reminded us of signs to seek: By contrast, the fruit of the Spirit is love, joy, peace, patience, kindness, generosity, faithfulness, gentleness, and self-control. When we find ourselves experiencing these fruits, we again are experiencing God among us. The Presbyterian Student Fellowship at WVU is an UKirk ministry charged with reaching, loving, and teaching college students so that they may be lifelong followers of Jesus Christ. 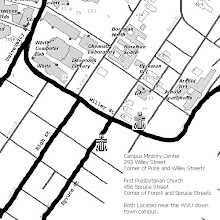 We meet on Wednesdays during the school year at 7 pm @Campus Ministry Center (map in sidebar). Dinner (free) starts around 7 pm and program around 7:36 pm. The WVUkirk-PSF is an open and affirming fellowship grounded in the traditions of the Presbyterian Church (USA) but not limited to only those who are Presbyterian. welcoming anyone, regardless of race, gender, sexual orientation, or religion. Our aim is to grow as disciples of Jesus Christ through prayer, study, worship, fun, and service.